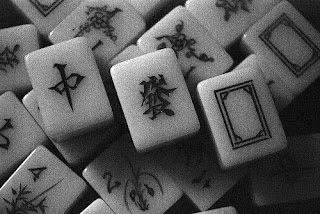 on the mahjong table, there are just as much ups and downs when there are wins and losses. despite the fact that the saying goes, "all is fair in love and war", when war has been declared and is raging on the table, nothing is ever quite so fair. having said that, apparently, it is not at all uncommon for friends to become enemies on the table. for one, it is finally nice to break the all time curse of losing. as to my first wins, well, they were not quite on local ground, and not on the usual table of four, but rather the odd three. nevertheless, it is nice to not be on the losing end for once though it has been long accepted that winning and losing is all part of the game. on the return, well, guess it is really back to the usual, the losing continues. the only difference this time around, is that at least the losing ain't quite so much due to lousy technique, but losing on the factor of luck. and yes, thirteen odds was still never quite formed, though it was markedly improved to missing it by one tile, or was it two??? all in all, to the victor goes the spoils. better luck next time around. congrats on finally winning. more will come. when are you leaving exactly? september beckons.